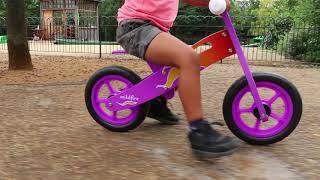 The boppi Wooden Balance Bike is ideal to help your child improve their balance and confidence on two wheels. With no complicated pedals or gears to master the bike is propelled with a simple walking motion. The lightweight wooden frames are made from environmentally-friendly birch plywood and beautifully painted in a series of eye-catching and fun designs. Each balance bike comes with a height-adjustable padded seat, a detachable bell and are easily assembled with the tools provided in the box.